“Glorious is He Who made his servant travel by night from Al- Masjid-ul-Haram to Al-Masjid-ul-AqSa whose environs We have blessed, so that We let him see some of Our signs. Surely, He is the All-Hearing, the All-Seeing.” Shab e Mai'raaj the 27th night of the month of Rajab. Believers celebrate this night in connection with the journey of Mai'raaj of Holy Prophet Muhammad ﷺ. This night is celebrated as Eid Mai'raaj u Nabi, Jashan e Mai'raaj u Nabi in Pakistan. Gatherings of Zikr are conducted, in this regard we are gathered here, May Allaah Ta'aalaa accept our participation (Ameen). It is impossible to give details of this journey therefore I will tell you this event summarily. Keep this important point in mind that one who denies the journey of Mai'raaj i.e. from Masjid ul Haram to Masjid Aqsa is Kaafir (non-believer) because it has been clearly mentioned in Holy Qur'aan. The one who does not believe the journey from Masjid Aqsa to heavens is Fasiq (wrong doer). The one who does not believe the journey from heavens to Kaaba Kosaien is devoid of love of Ieemaan and blessings. This visit has been mentioned in the holy Qur'aan. First I will give answers to few objections and then I will discuss the journey. “Glorious is He Who made his servant travel by night” LAIELLAN, means within the short part of the night. From Masjid ul Haram to Masjid Aqsa. Which Masjid Aqsa, that Masjid Aqsa whose environs have been blessed by Allaah Kareem. Why did Allaah made prophet to visit, in order to show His signs that belong to vision. No doubt Allaah is All Hearing and All Watching. In this verse Arabic word INNAHU there is zameer which according to some scholars points towards Allaah that He made his servant visit while others say it is pointing towards Prophet Muhammad ﷺ i.e. he was made to visit. I accept both versions that Allaah is watching and hearing Prophet and Prophet watching n hearing Allah; so dispute got solved. This verse started with the word SUBHAAN, which means devoid or free from all objections and shortcomings. By starting with the word Subhaan, Allaah Ta'aalaa has shunned all the objections. Those people who say how a human being visited heavens, how he lived without oxygen, on this earth one may stay on one leg but cannot raise both legs how prophet went at such height, there are two zones in the atmosphere one is so much cold other is so much hot how he passed from there, how he completed such a long journey in a small part of the night. Allaah has answered all objections by saying that Great is that Who took prophet on that journey. We all know that Allaah can do whatever He likes, He has no limits or weakness; we cannot think of His any Weakness or limit. If Holy Prophet Muhammad ﷺ had made such claim that he visited Masjid Aqsa, Heavens and beyond that in a short part of night Muslims would have accepted and ratified it. But Allaah Kareem was aware that there will be such persons who would raise objections, Allaah Ta'aalaa did not want to have objections over His beloved Prophet, [Salal Laahu Alaiehi Wa Sallam] therefore Allaah Kareem said I took him on that journey so whoever has any objection he may Object Me Allaah not prophet as whoever objects Allaah, people will come to know that he does not believe in the powers of Allaah Ta'aalaa. Therefore Allaah Kareem did not ask prophet to claim but claimed Himself that He took prophet to that journey. The most beautiful event of this holy month is the the blessed journey of Mai'raaj which was held on the night of 27th Rajab. 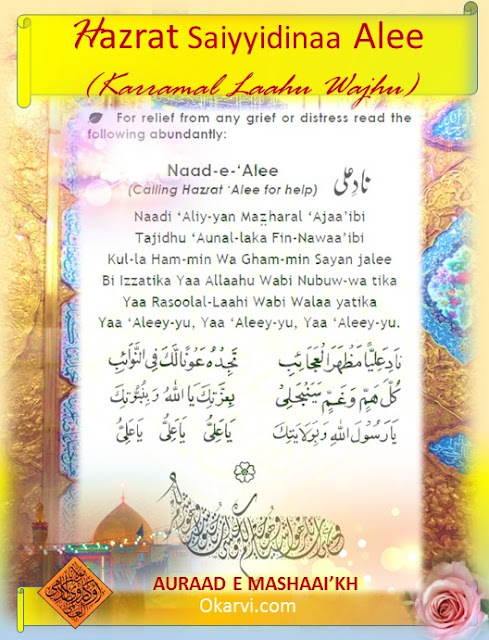 Laielatul Mai'raaj is the night in which the beloved holy Prophet (Sallal Laahu Alaiehi Wa Sallam) ascended to the heavens and beyond to meet his Rabb. It is a miracle that was not granted to anyone else before nor will it be granted to anyone in the future. “Glorious is He Who made his servant travel by night from Al- Masjid-ul-Haram to Al-Masjid-ul-AqSa whose environs We have blessed, so that We let him see some of Our signs. 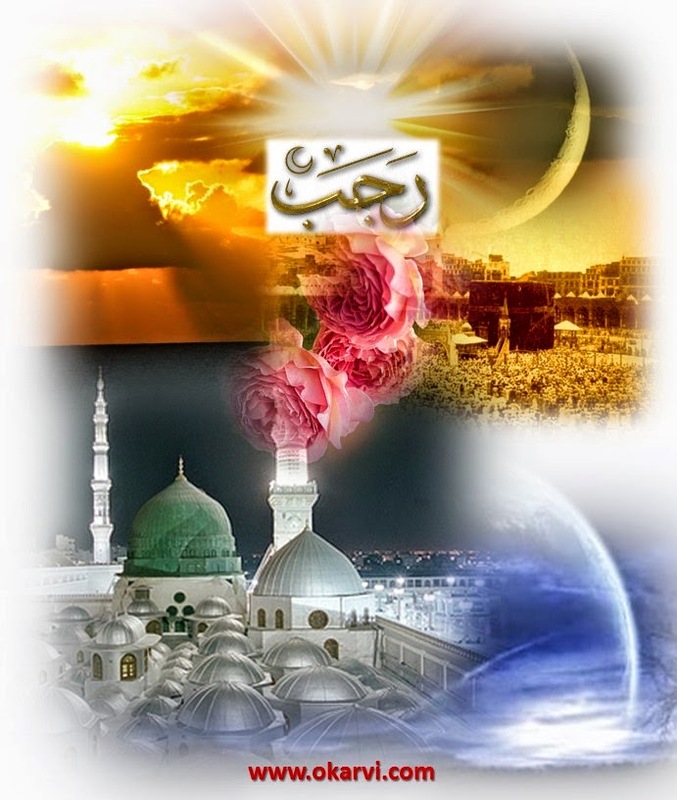 Surely, He is the All-Hearing, the All-Seeing.” Shab e Mai'raaj the 27th night of the month of Rajab. Believers celebrate this night in connection with the journey of Mai'raaj of Holy Prophet Muhammad ﷺ. 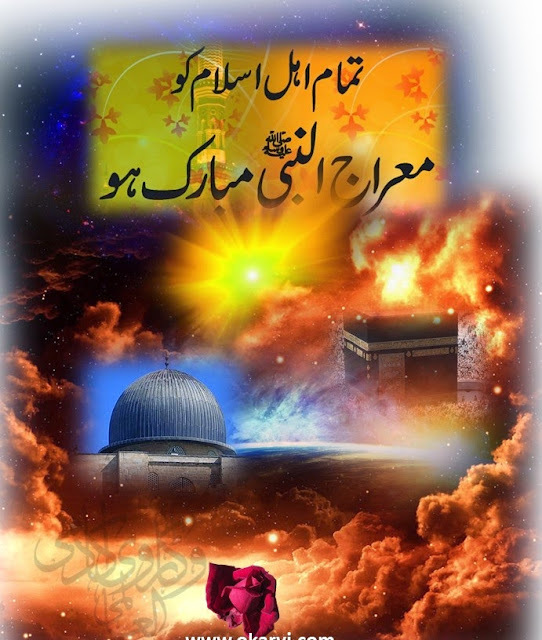 This night is celebrated as Eid Mai'raaj u Nabi, Jashan e Mai'raaj u Nabi in Pakistan. Gatherings of Zikr are conducted, in this regard we are gathered here, May Allaah Ta'aalaa accept our participation (Ameen). It is impossible to give details of this journey therefore I will tell you this event summarily. Keep this important point in mind that one who denies the journey of Mai'raaj i.e. 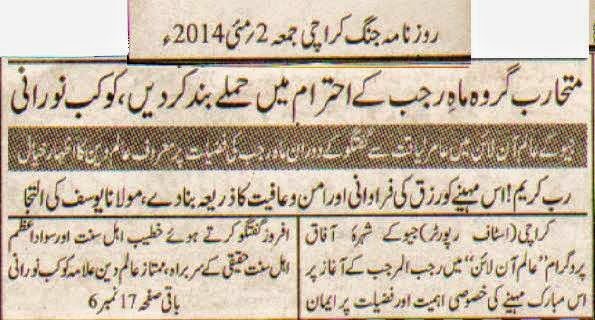 from Masjid ul Haram to Masjid Aqsa is Kaafir (non-believer) because it has been clearly mentioned in Holy Qur'aan. 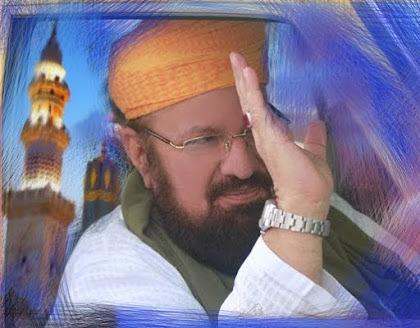 The one who does not believe the journey from Masjid Aqsa to heavens is Fasiq (wrong doer). The one who does not believe the journey from heavens to Kaaba Kosaien is devoid of love of Ieemaan and blessings. This visit has been mentioned in the holy Qur'aan. First I will give answers to few objections and then I will discuss the journey. Allaah Almighty says, “Glorious is He Who made his servant travel by night” LAIELLAN, means within the short part of the night. From Masjid ul Haram to Masjid Aqsa. Which Masjid Aqsa, that Masjid Aqsa whose environs have been blessed by Allaah Kareem. 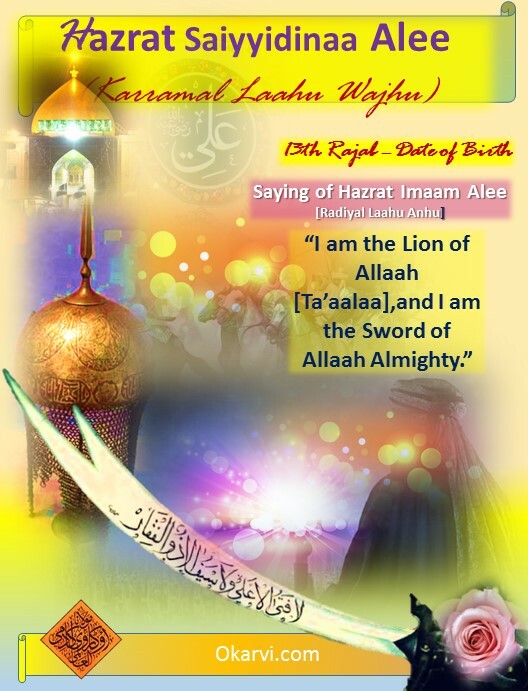 13th Rajab –Date of Birth-Honoring and Remembering the Great Imaam. He was at the same time master of the Pen and Sword — a rare combination. Even today in the battle fields the Cry of “Yaa Alee !” resounds, invoking his help. There are many historical incidences where Hazrat Ali was always at the Prophet Muhammad’s [Sallal Laahu Alaieh Wa Sallam] side working to forward the cause of Allaah Kareem. This meant not only educating the new Muslims about the fresh revelations but also defending the believers from the opposition to this new faith. Hazrat Abu Dharr [Radiyal Laahu Anhu] reports that before Hijrat, when the Kufaar were planning to martyr the Prophet [Sallal Laahu Alaieh Wa Sallam]. Sleeping that night on the blessed bed of the Prophet [Sallal Laahu Alaieh Wa Sallam] [as per instruction of the Prophet] showed his bravery and his faith in the Holy Prophet [Sallal Laahu Alaieh Wa Sallam]. “ Hazrat Alee [Radiyal Laahu Anhu] was one of the most courageous and able men in the Muslim army. He was appointed the standard-bearer at the battles of both Badr and Khaybar. He partook in all the great battles except in the Battle of Tabook. “Hazrat Ali was never defeated in a war or a combat throughout his life. His physical strength was beyond human comprehension. He went forward in the Love of Allaah Kareem and His Rasool [Sallal Laahu Alaieh Wa Sallam] and uprooted the Door of the Fort of Khaibar with his bare hands and used it as a shield. Hazrat Imaam e Azam Abuu Haneefah [Rahmatul Laahi Alaieh-4th Rajab- Honoring and remembering the Great Imaam ul A'azam. "In every century, a number of my Ummah will attain to high grades. Abuu Haneefaah will be the highest of his time." These two Ahadees are recorded in "Durr al-Mukhtaar." 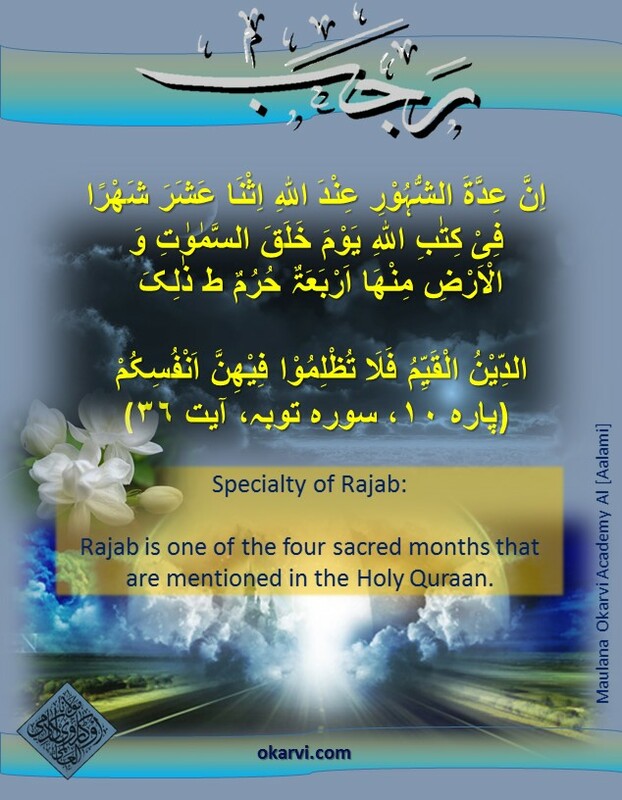 Rajab is one of the four sacred months that are mentioned in the Quraan.